Wow, what a month! We had family in town for Benjamin's baptism, then the computer monitor died. On the day we got a new monitor, the internet went down. Once that began to get resolved I left for a week of church Young Women's Camp (read:no internet) HA! So while I've had a lot of fun and some frustration, this blog has been a little neglected. How have YOU been? 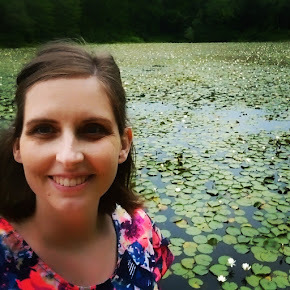 Today I wanted to start telling you about one of my new favorite series. 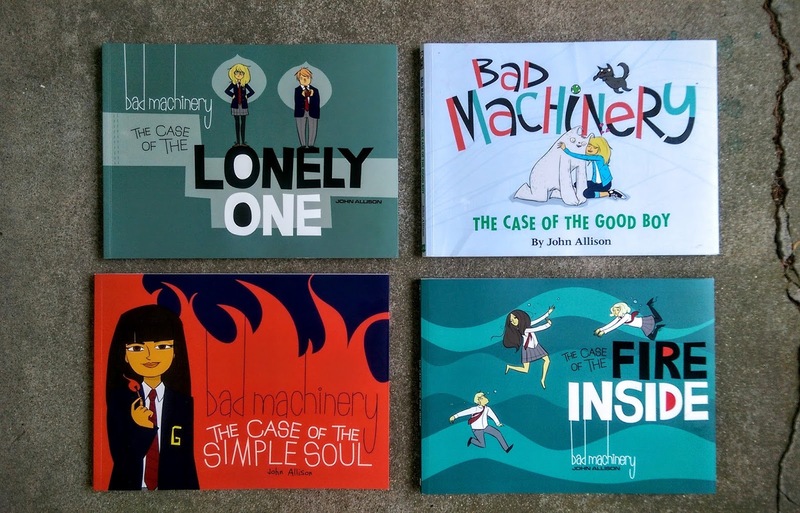 It is Bad Machinery, by John Allison. Hopefully soon I'll have an interview with John Allison himself for you! And that is just so exciting to me. 1. They are graphic novel/comic format. 2. They are a webcomic, originally published in England, and now coming to the USA in print via Oni Press. 4. They have appeared on this blog before, in my 2015 holiday recommendations post, in my announcement of the Cybils shortlist, in my guide for reading books that were first published outside of the USA, and in my post recommending books for teenage boys. 5. The basic premise is that six English pre-teens go about living life and investigating paranormal mysteries. When my friend Ashlee asked me for a book recommendation recently, I thought long and hard about it and Bad Machinery came out on top. See, she's back in school and needed something fun to read, to relax with. Usually she loves non-fiction, but her textbooks were enough on that front. I know she loves the humor of The Office, and she loved The True Meaning of Smekday. If you like The Office and Smekday, Bad Machinery is on the right track. I recommended that Ashlee start with book 2 in the series, The Case of the Good Boy. That's the book I started with, and I was hooked. I had my mom start with book one, The Case of the Team Spirit, and she wasn't immediately on board. I think The Case of the Good Boy is a little more cohesive? So now I recommend it as a starting place. It's the one I started with, and I treated book one as a prequel. Here are all the books, in order. Cases 6, 7, and 8 are available to read online (In fact ALL of the stories are available online, here) but like I say, the books are even better in print than online. Why? Because they're easier to read, there are extra pages, and the drawings have been re-worked just slightly to make them even better. In my opinion, the paper versions are worth it. In fact that's one reason I reached out to Oni Press and asked if I could work with them on promoting the series. I love that they're available online, and I love that the books are even better. The publisher sent me books 3,4,and 5 (Yay! it was SUCH fun to get that package.) and like I mentioned earlier, an interview with John Allison is in the works. I hope you give these books a shot. I hope you encourage your library to buy them. More libraries need to have them, in my opinion. Hit me with any questions you have for the author, or just any questions you have in general. See you soon! oh! I wanted to read these, at least #2, when I was at your house. sigh! I have been waiting for that because, like you said - #1 just sort of left me needing a little more of the story to feel into it.